Google has launched a contest to solicit ideas about how to help humanity - Google Project 10tothe100. "To mark our 10th birthday and celebrate the spirit of our users and the Web, we're launching Project 10^100 (that's 'ten to the hundredth') a call for ideas that could help as many people as possible, and a program to bring the best of those ideas to life," Andy Berndt, managing director at Google's Creative Lab, said in a blog post. Project 10^100 allows Internet users to submit ideas about how to make life better. The problems addressed can be related to social, financial, energy, environmental, health, educational, or housing issues, or something else entirely. The goal, Google says, is to help people and to empower people to help others. Google has committed $10 million to fund up to five of the best ideas, as determined by Google's advisory board. The submission deadline is Oct. 20. On Jan. 27, 2009, the top 100 ideas, as determined by Google staff, will be presented for the public to vote on. The top 20, chosen by the public, will be winnowed to five or less by the advisory committee and announced in February. What do contest participants get for their gifts of thought? "You get good karma and the satisfaction of knowing that your idea might truly help a lot of people," Google says. Google gets a bit more than that out of the deal. It gets thousands, perhaps tens of thousands of dollars of free publicity out of its sponsorship of the contest. That's the sort of thing Google, as an advertising provider, knows and values. 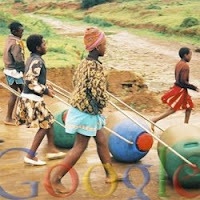 Were Google's interest purely philanthropic, it could donate $10 million without announcing its generosity to the world. But more subtly troubling is that Google's insistence that contest participants part with their ideas without compensation echoes the company's tradition of making use of people's intellectual property without payment. What is Google's index after all, not to mention YouTube, but a treasure trove made from words copied from copyrighted content? Those words might be worthless in isolation but they're invaluable aggregated and indexed. If you have a good idea, a really good idea, the sort of brilliant idea that might win Google's contest -- a way to produce a $0.01 straw that removes all impurities from contaminated water, for example -- why give that valuable idea away when you could commercialize it? You could start a company to support your idea, provide jobs to people, and help humanity at the same time. All over the world where the sun power is available there if arrange solar plates a lot of polution is reduced hence there is no globle worming effect and every house or hut will acts as a source of energy. the idea for googles' business must be fantastic. The googles may be looking for sponsoring some PhDs. And thats it. My idea involves a kind of tire which makes use of piezoelectricity effect to economize energy. As important parts of automobile, the tires make vehicle adhere to the earth’s surface well and so ensure its function on traction, braking and passing. The tires bear all the weight of vehicle and transfer traction force at the advance direction and the forces and moments at the other directions, as well as absorb and cushion the pounds and vibrations from ground. Most of the power from engine realizes works through the tires while match part of the power consumes on inside of the tire and makes it give out heat and fatigue. The evolutions of materials and structures, such as from vulcanized rubber to artificial rubber, from narrow rim to wide rim, from oblique crossing to meridian, from solid tire to gas-filled tire, from fabric curtain to steel wire curtain and so on, have made considerable headway on enhancing bearing capacity, lengthening service life and improving smoothness and safe driving, while we longitudinally scan the history of tire development. Whoever there is no any technical improvement being aimed at recovering energy consumed inside the tire so far such as a technique bottleneck. The objective of my idea lies in putting forward a solution witch partially recoveries energy consumed inside the tire, makes partial energy consumed by internal friction of material being in elastic deformation transfer to utilizable electricity. The central point of my idea lies in rationally using functional high polymer with powerful piezo-effect as medium of energy transfer and effective method of collecting electricity. Implementation of my idea will set off a new round of technique change in tire industry. Googles are spotting the talent world wide. Its a unique exercise of its own kind. And probably will give weightage to the people belonging to rural area of developing countries. Submit your idea earlier the better. I think that this kind of creativity should be encouraged by more. More of us can hopefully be better off and live more fulfilled lives if we seek to help others. I have heard it said that the original inhabitants, natives of North America belived that life is a circle, what what goes round come around. Too often those who are in a position of power seek to try to holds up good ideas in order that they or their friends, colleagues can personally benefit but at a later date. So many inventors have died poor. So many artists died poor only to have others make money. Thanks to Google to reaching out. Andrew Carnegie who was born in Scotland and later moved to the United States where he made his fortune did much with his help for libraries and other goodwill things, setting this up before he died in the United States. I think there has to be effective cures for more diseases out there in part through diet for example but we have to encourage people to try and credit them when they succeed.